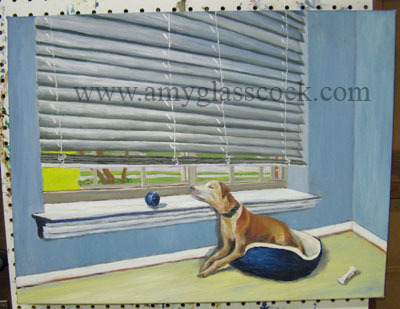 I have decided to paint Violet again- this time at her beloved window. I'm starting with the layout of the room. I changed the color of the carpet. Made it more muted with blue grays and white. (The yellow was still wet.) 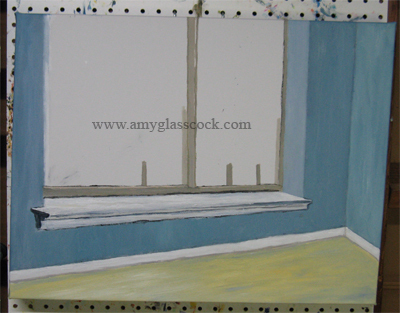 I also began working on the window sill (which still has a ways to go) and I change the blue on the inner side of the window to a lighter blue to show the light coming in. 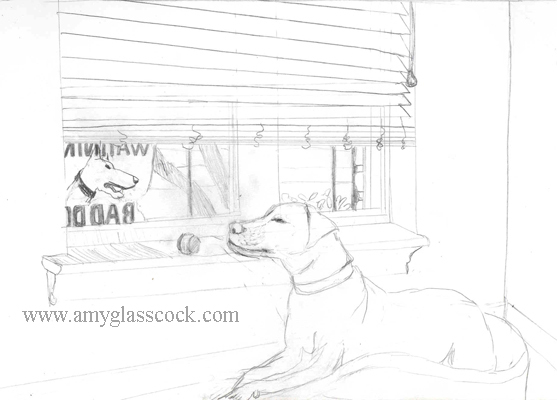 I also started the pains in the glass though I am not sure I like how the line in the middle looks crooked. 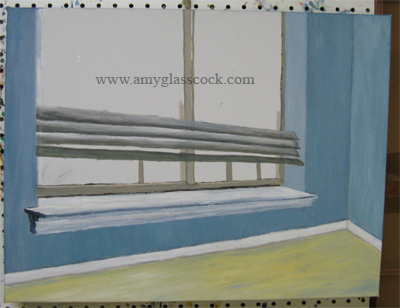 I worked on the window sill by adding white and making it a bit wider. 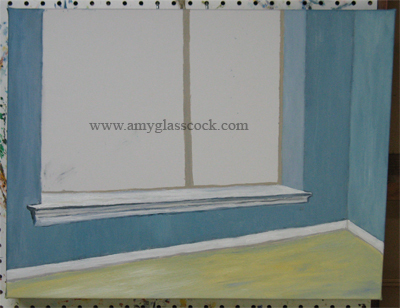 I also added white to the trim near the floor and a darker line for a shadow. 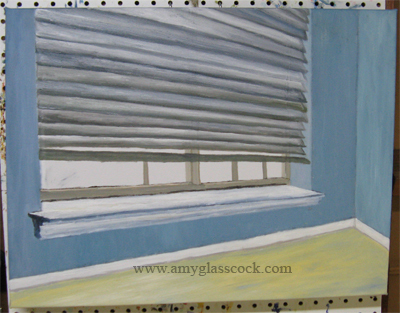 I started adding the blinds today. 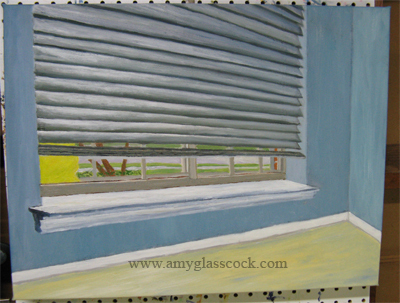 I am trying to show the light peaking through at each slat which requires a gradation on each stripe. 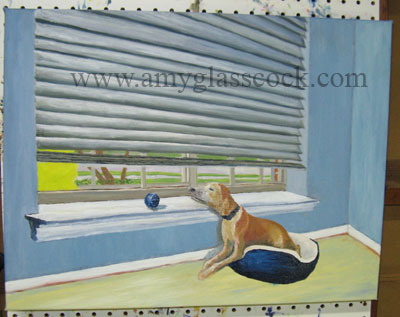 I am still blocking in the shapes of the blinds. I will have to go back and fine tune the colors once I get all the shapes in though. 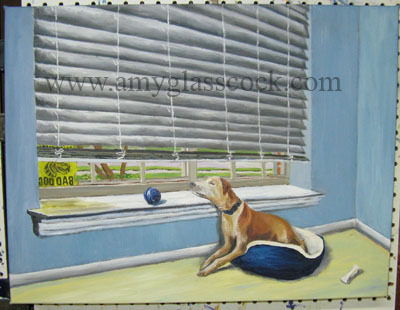 I added more definition to the shades and I also added the brick and shutter on the right outside of the glass and began painting the yellow bad dog sign on the left. 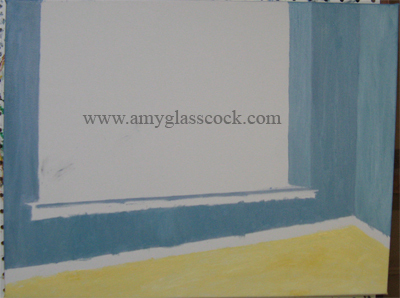 Also, at the bottom I added some orange in the shadow which really pops with blue, its compliment. 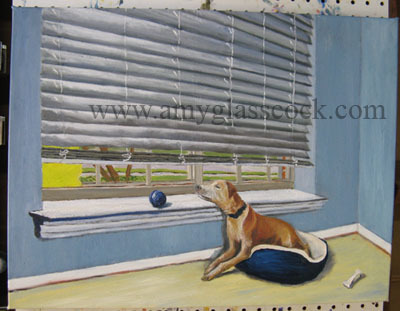 I added some white to the blinds. 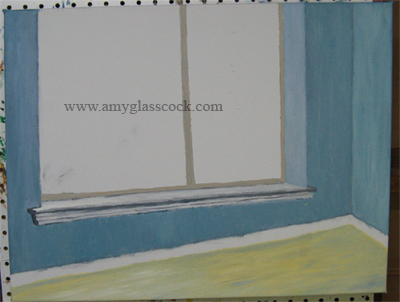 I also started working on painting the tree and the street outside the window. 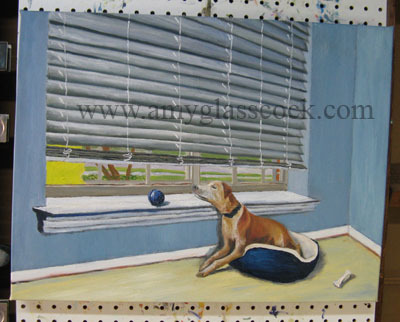 I added Violet, her bed, and her ball today! I added Violet's bone today. It often gets stuck to the carpet so it sticks up in the air. I also started adding the blind strings. I added more blind strings today. 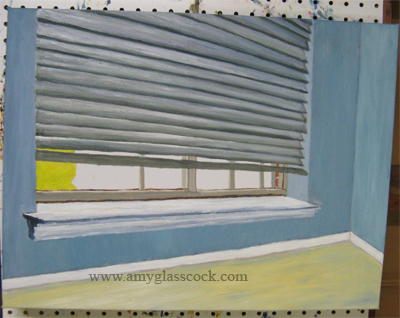 I decided that I needed to work on unifying the color and shading of the blinds so I am repainting each line. Goodbye- blind strings!